In our first reading (2 Samuel 5:1-3), we hear the account of the anointing of David, the last great king of Israel. David was chosen by God and the people to be their king. 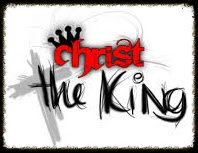 As the human, earthly king, he is the ancestor of Jesus, the "Son of David", the divine, heavenly King of the universe. In those days, all the tribes of Israel came to David in Hebron and said: "Here we are, your bone and your flesh. In days past, when Saul was our king, it was you who led the Israelites out and brought them back. And the LORD said to you, 'You shall shepherd my people Israel and shall be commander of Israel.'" When all the elders of Israel came to David in Hebron, King David made an agreement with them there before the LORD, and they anointed him king of Israel. In our Gospel reading (Luke 23:35-43), we hear the familiar story of the two thieves being crucified with Jesus. The one mocked him and the other recognized his heavenly kingship. Now one of the criminals hanging there reviled Jesus, saying, "Are you not the Christ? Save yourself and us." The other, however, rebuking him, said in reply, "Have you no fear of God, for you are subject to the same condemnation? And indeed, we have been condemned justly, for the sentence we received corresponds to our crimes, but this man has done nothing criminal." Then he said, "Jesus, remember me when you come into your kingdom." He replied to him, "Amen, I say to you, today you will be with me in Paradise." In our Epistle reading (Colossians 1:12-20), Saint Paul paints the beautiful picture of just who this Jesus, King of the universe, is. He is Lord of "all things", the "first born of all creation". Brothers and sisters: Let us give thanks to the Father, who has made you fit to share in the inheritance of the holy ones in light. He delivered us from the power of darkness and transferred us to the kingdom of his beloved Son, in whom we have redemption, the forgiveness of sins. He is the image of the invisible God, the firstborn of all creation. For in him were created all things in heaven and on earth, the visible and the invisible, whether thrones or dominions or principalities or powers; all things were created through him and for him. He is before all things, and in him all things hold together. He is the head of the body, the church. He is the beginning, the firstborn from the dead, that in all things he himself might be preeminent. For in him all the fullness was pleased to dwell, and through him to reconcile all things for him, making peace by the blood of his cross through him, whether those on earth or those in heaven. Our Jesus is not only King of the Catholics, or King of the Christians, he is King of all creation, from the beginning of time. May we proclaim that with our daily lives.